THEN Switch in-store hot chocolate drink to 100% Fair Trade and increase visibility of Fair Trade products. Support fair trade and come to Manitoba's first ever Carrotmob! We've teamed up with Chocolatier Constance Popp to vote with our dollars and support a local business who has made a commitment to Fair Trade products. 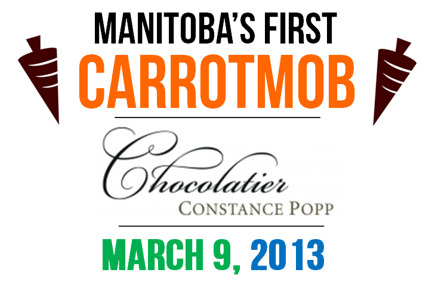 The mob will happen March 9th, 2013 at Chocolatier Constance Popp's (1853 Portage Avenue, Winnipeg). As part of Fair Trade Manitoba's One Month Challenge, we will be hosting an all-day event on March 9th, 2013 featuring music, speakers and activities. The mob will bring people to Winnipeg's Chocolatier Constance Popp, the city's premier chocolate shop to support their decision to affirm their commitment to Fair Trade. Chocolatier Constance Popp has pledged to significantly increase the visibility of fair trade certified products in their locations. In addition, they have committed to switching their popular in-store hot chocolate drink to 100% fair trade chocolate.